Get your nails runway ready with Nykaa's Matte Nail Lacquer Collection. Keep these gorgeous shades on standby for the times when you want a more sophisticated vibe. Presenting tempting shades that dry to a stunning matte finish, this collection is dedicated for the 'It' girl in you. It's time to embrace your chic, daring side with these alluring matte nail paints. Our fashion-forward matte nail polish collection is bound to win every fashionista's heart with its rich pigments and long-lasting color. From urban-chic pastels to daring deep hues, our matte collection has something for your every mood. White Chocolate Ganache (Shade No. 07) : A chocoholic's real-life fantasy, that's exactly what our White Chocolate Ganache is! Go ahead and dip your pinkies in this enticing, guilt-free treat. Leave a sweet trail behind you as you strut your style. Black Cherry Pie (Shade No.08) : Up for some dark romance? Our Black Cherry Pie looks so good, that even heaven can't save you from falling for this dark fantasy. Take matters in your hands and make your wildest dreams come true with this stunning berry hue! Black Sesame Pudding (Shade No.09) : Not for the faint-hearted, our Black Sesame Pudding is as surprising as its name. Treat your nails with this exciting, bold hue. Delectable and mysterious, this shade will leave you wanting for more. Squid Ink Mousse (Shade No. 14) : Did somebody call for Mr. Grey? Explore the unfamiliar with our fascinating Squid Ink Mousse. Indulge in some sweet, unconventional romance as you dip your nails in this alluring grey hue. Let the mystery float around you as you walk down the street, commanding the attention that you deserve! Lavender Panna Cotta (Shade No. 15) : Get ready to indulge in some decadent Lavender Panna Cotta. Shower some creamy love over your nails with this vibrant pastel goodness! Let your romance bloom like a lavender in the summer with this stunning shade. Blueberry Frosting (Shade No. 16) : Sweeter than sugar, our Blueberry Frosting is a sheer treat for the senses minus the calories! Splash this delectable shade on your nails, reminiscing about summer frolic of days gone by. Oh come on! We know you can resist this sweet, sweet craving! Cool Blue Granita (Shade No. 17) : Move over ice cream, granita is here to stay! Cool off your nails with our refreshing Cool Blue Granita. As invigorating as its name, this icy hue will instantly transport you to those fun, summer evening outings. A big scoop of fresh granita? Yes, Please! Blueberry Macaron (Shade No. 18) : If you thought you're in for a treat, you're absolutely right! Pop some bath bombs in the tub and soak your pinkies in this pastel heaven. Treat your nails to the pampering they deserve with our delectable Blueberry Macaron. Matcha Tiramisu (Shade No. 19) : Say Kon'nichiwa to the delicious Matcha Tiramisu, while you take on the world, one nail at a time! Give your nails the morning 'pick me up' with this humble and earthy hue and remember to kill them with kindness. Pink Meringue (Shade No. 28) : Let your nails swirl in the delicieux and airy Pink Meringue, bringing some sweet memories of a fine, summer picnic. Immerse your vintage soul in the endless romance of the gorgeous pale pink hue as you sip some Oolong tea. S'mores Milkshake (Shade No. 29) : Let your nails bring all the boys to the yard with a scrumptious S'mores Milkshake! As fun as a campfire night, this yummy, creamy hue brings a twinkle to your eyes. Get in your girlies and revive those adventurous summer nights! The Nykaa Matte Nail Lacquer Collection is FIVE FREE. The Nykaa Matte Collection is NOT tested on animals (just on our team!) and contains no animal-derived ingredients. Explore the entire range of Nail Polish available on Nykaa. 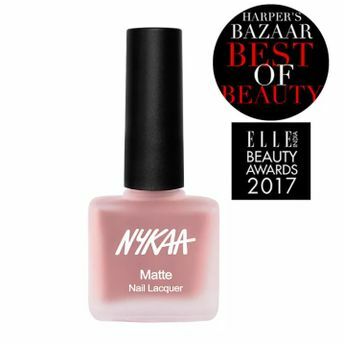 Shop more Nykaa Cosmetics products here.You can browse through the complete world of Nykaa Cosmetics Nail Polish .Alternatively, you can also find many more products from the Nykaa Matte Nail Enamel range.